Photographed March 2012 in the New River Mountains, Maricopa Co., Arizona, USA. The specimen is about 10 mm. Damsel Bugs, despite their delicate appearance and name, are important predators of many plant feeding insects. Their piercing-sucking mouthparts can project forward and into the soft body of a caterpillar or plant bug. The bite soon immobilizes they prey and the Nabis quickly drains the liquid contents. Farmers and gardeners appreciate the roll these insects play in keeping pest species in check. 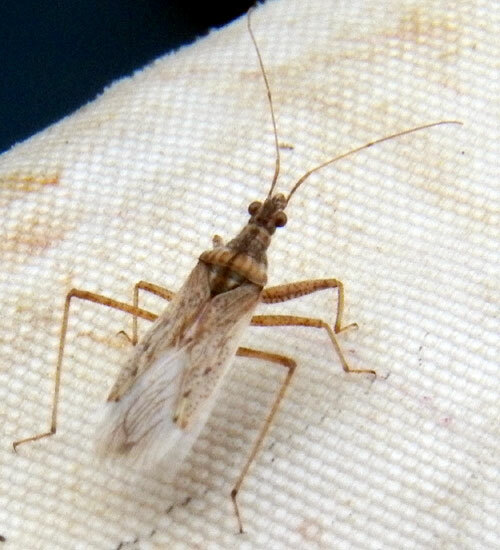 Occasionally if these bugs get trapped against the skin they will bite in defense, but otherwise they are not blood suckers.